• Venting: At least two vents are required. • Gear Pump: Depend on the application. Well designed screw with steady pressure output should be sufficient for most extrusion techniques. It is suggested that melt temperature and pressure is monitored to provide sufficient control over the process. 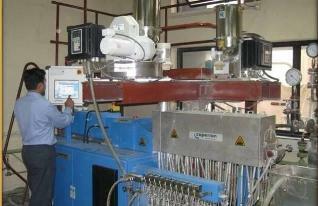 The dwelling time of the Gharda PEK polymer in the extruder barrel influences the quality of the final product. The thermal stability of Gharda PEK is excellent.